Tex-Mex food abounds at our house. All.week.long. There are many reasons that we moved our family from Ohio to Texas in 2012. And I’m beginning to think that one of the sub-conscience reasons for moving was to be back in the land of amazing Tex-Mex food. I love enchiladas. They are one of those ‘phase foods’ for me…I go through spurts of making them two, even three, times a week…and then forgetting about them for a few weeks, only to find myself making them twice in the same week again. Bring on the enchilada phase, and bring on Cinco de Mayo. If you’ve never made enchiladas before, these are the ones to start with. 4 Ingredients. They are simple, delicious, and if you screw up the rolling up the tortilla part, you can just layer everything in a casserole dish, and call it ‘layered enchiladas.’ No one will ever know. Hope you enjoy these simple and tasty enchiladas!!! Preheat the oven to 350 and lightly grease a 9×13 inch baking dish with non-stick cooking spray. In a mixing bowl, combine the cooked and shredded chicken with ½ cup of the salsa verde. Warm the tortillas in a slow oven, or wrapped in a dishtowel in the microwave. Warmed tortillas fold and roll better when making enchiladas. Spoon a thin line of the chicken-salsa verde mixture into a corn tortilla and wrap tightly and place seam side down in the baking dish. Repeat until the chicken, tortillas are used up and the baking dish is packed full of enchiladas. Pour the remaining salsa verde sauce over the top and then sprinkle about 1 to 1 ½ cup shredded cheese on top. Bake in the preheated oven for about 20 minutes, or until cheese has melted and salsa verde is bubbling. 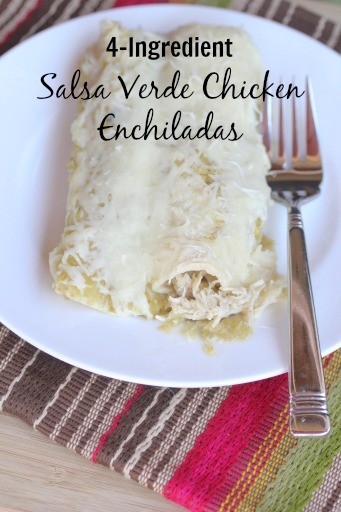 Serve warm Salsa Verde Chicken Enchiladas with side of rice and refried beans.